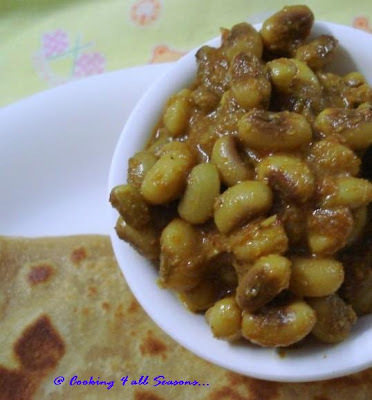 Cooking 4 all Seasons: Fresh Black Eyed Peas Kurma! The roads never seem to end, the journey even more. It was the first time we embarked on a road trip in car for nine long hours. Hubby dear was very adventurous when he said we will visit his sister's place for the long weekend. It was not planned, I guess that made it even more exciting and interesting. The chances of it being not taken was remotely less and it gave less time for Athamma to say no for a long drive in. But seriously I enjoyed! We didn't feel the distance until the last 100 kms or so. It was beautiful driving past the green lands, with crops all ready for harvest. We drove past many villages and towns. The best was the lonely land, where to an eye's distance there was nothing but we and the beautiful land! If only we could live in such a beautiful green place! Since it was a long journey, I was fully prepared with the kids favorite snacks and I kept them engaged with one snack after the other. Else I knew they would have wanted to sit on their father's lap, the moment they get in the car as normally they do. They slept for a while but most times, they were thrilled seeing the cows and sheep on the roads. Though I had the breakfast and lunch packed, we stopped at a motel for breakfast. All motels seems to have play things for kids to entertain them. When breakfast was done, the kids refused to leave the place. We somehow managed to get them back and only stopped again for the lunch. The spot was a beautiful no man's place with lush tamarind trees on both sides and it also had a rock bench. We spread our things and had a quick lunch. Athamma disappeared for a moment to be back with a load of fresh tamarind. She made a yummy looking chutney with it back home. We reached my sil's place by late afternoon and it took a while for the twins to get used to the place. Since Konda had already been to their home and moreover she is never so shy. Once the boys got to know their surroundings, they enjoyed max! My other sil also came along with her kids. So as I always tease hubby, it was one big family reunion! Only missing part was the song that they never finalized! I am sure Athamma enjoyed seeing her daughters and grandchildren in one place. Though I was resisting the urge, the delicious array of dishes that my sils prepared were not something that could be ignored. They ensured they made all our favorite ones. Right from the tempting Uggani to Mirapakaya Bajji, going to the lengthy Sunday special, everything was a treat! 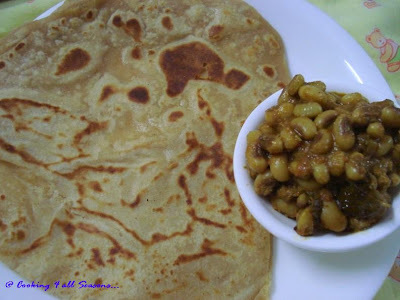 Add the coconut paste, 1 cup of and pressure cook for 1 whistle or till the beans are cooked. 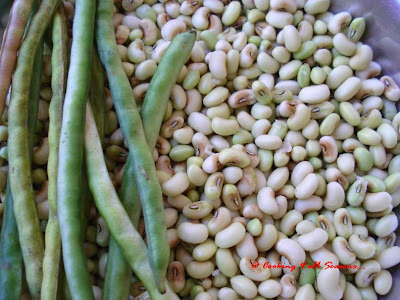 Since these are fresh beans, it won't take much time to get cooked. So keep an eye on them, else you will have a mashed peas on hand!